Title: Dash India : Workshops, Community Building, Educational Content. Over the last month, Dash India has been working on revamping our research report. We are pleased to release it to the network today. This report contains material and analysis on the Indian Remittances Space and also includes a targeted survey, which we have compiled from filtered respondents over the last month. While the report pertains to India, we believe it contains information relevant on Remittances to many other geographies. India is the world’s largest Remittance Market and amongst the fastest growing economies (+7.4%). Every year, Indians send nearly $65 Billion back home and pay $5 Billion in remittance fees alone to services like Western Union and Banks. By Utilizing Dash to send Remittances to India, users can not only save significantly on fees but also send money quickly. However, many users, especially in India, shy away from using Crypto due to lack of awareness and low trust in Crypto. 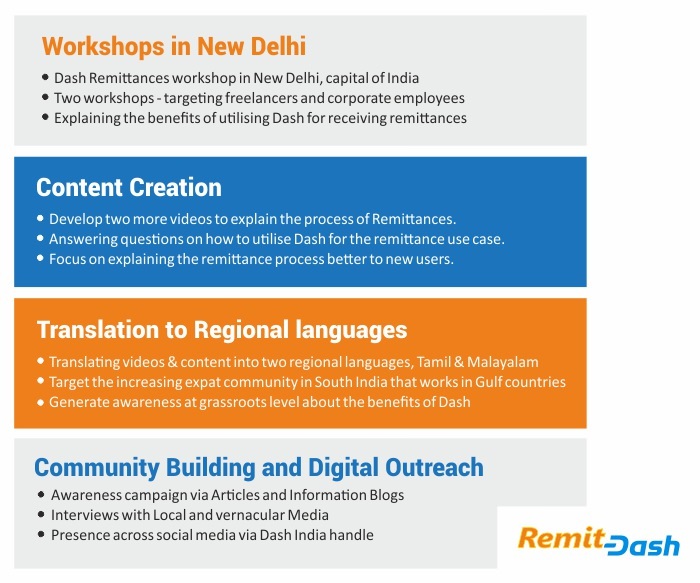 To increase awareness and develop confidence, the Dash India team has developed Remitdash.com, a one stop platform with educational content around remittances and a full fledged guide to enable new users to make transactions and proactively answer doubts . We have also developed two animation-style videos in Hindi and English to educate users about Dash In India. Our work has also been noticed by Dash Force News recently. This project also furthers our mission of building a Dash empowered India Community. We propose to take our work further and conduct two workshops, develop more educational content in regional languages and drive public awareness for Dash in India through a mix of online and offline methods. We hope to receive your support to increase the reach of Dash in India and build a large community of Dash users for Remittances. These workshops will be the first on-ground initiative for Dash in India. We propose to conduct two workshops in New Delhi with Dash users interested in Remittances and explain the benefits of utilising Dash for receiving remittances. To ensure maximum impact, we intend to conduct the first workshop at a co-working space with a significant number of Freelancers, which is an ideal set of users for Remittances. Freelancing is rapidly increasing amongst young users and saving remittance fees can significantly add to their paycheck, making it a perfect market for Dash Remittances. This two-hour educational workshop will leverage content created by our team and initiate new users into Dash. Our work thus far has centred around creating educational content for new users, creating high quality animation videos and researching the Indian Remittances market. RemitDash Platform : To promote the use of Remittances in India, we created Remitdash.Com to collate all information on one platform for users. We intend to build this platform in more languages to cater to every large segment of the Indian population. Explainer Videos: We created two explainer videos about Dash in two different languages (English &amp; Hindi) that explain remittances to new users. The videos explains the remittances via Dash to new users and walks them step by step through the process. Research : Our team has researched the Indian market and compiled an exhaustive research report on the Indian Remittance market and its various segments. The report takes a closer look at the different segments of the Indian markets and lays out an action plan for the Dash Community to target the Remittances Industry. The research report can be accessed HERE﻿. Media + Social Outreach: ﻿ Our project has been covered in a leading regional Indian Daily Newspaper and we were recently covered by Dash Force News. We have given interviews to two crypto magazines in India which are planned to be published in the coming weeks. India is the world’s largest Remittance market. With a 25 Million strong expatriate population, an Indian sends back $2800 every year on average. According to a World Bank study, the median cost of transferring money has remained nearly constant at 7.2% making money transfer a 5B/yr market in Fees Alone for transfer companies like MoneyGram and Western Union and banks (via wire transfer). With an additional tax of 12.36% on remittance charges, making traditional remittances even more expensive to process. This makes the overall cost of sending money significantly higher than World Bank’s sustainable development goal of 3%. With a population similar to the entire continent of Africa and rapid penetration of internet through low fee 4G Data plans, India is on the cusp of a mobile-first internet revolution. While money-transfer technology has remained stagnant, the growth of blockchain currencies has created an exciting alternate path for money transfer, leap-frogging existing channels. A small set of early adopters have taken to Cryptocurrency, mainly Bitcoin, to remit money. While Bitcoin has a clear headstart in terms of awareness and adoption in India, Dash is far better suited to facilitate Remittances than Bitcoin. Dash is instant, private and costs a negligible amount of money to send. By building trust in users, Dash can capture a piece of this large and lucrative market and gain strong adoption in the process. Supreet Raju is an Education Design consultant, working at the intersection of Consumer Internet marketing and Learning Design. She holds a Bachelors of Design degree from the prestigious NIFT, New Delhi and a Gold Medalist from the 2010 batch, an honour accorded to the top student across 8 Centres of Excellence nationally. She specializes in marketing through developing Educational programs for technology and helping new users understand things better through compact online learning. Please click here to view my Linkedin profile. Q1. Is it possible to buy and sell Dash in India? A1. Yes, Dash can directly be traded for fiat on local exchanges and trading desks like WazirX and Buyucoin. It can also be easily converted to Bitcoin/Ether and sold on exchanges like Remitano, Localbitcoins.com and Localethereum.com. Q2 What is the current legal status of crypto-currency in India? A2. Crypto-currency remains the subject of active debate in public, regulatory and legal discourse. A petition is currently pending before the Supreme Court of India challenging the RBI advisory to banking institutions mandating roll-back of support to exchanges. The Reserve Bank of India has also appointed a high level committee to understand crypto currency and develop a draft policy to regulate it. As such, crypto adoption has progressed unabated at the grassroots level and India accounts for 10% of the total crypto trade. These numbers could go up significantly in case of a positive developments on the regulatory front. 1. The first Dash India Remittance Workshop is scheduled on December 1. The venue and catering has been booked. More details to follow. 2. Two Videos are currently under development for explaining the remittance use case to new users. Scripts have been finalized and voiceovers/animations are being actioned on. 3. Translations of content to Tamil and Malaylam are under progress. 4. PR activities to planned to coincide with the first Dash India Remittance Workshop. I believe this proposal could turn into the next Venezuela! Glad to see this pass. They have produced a functional website. They produced a meaningful amount of video educational materials. They provided enough resources that people could send Dash to India and figure out how to convert to fiat on the receiving end. Despite the big drop in Dash value, they still produced a meaningful result. They have been responsive to the community. Thank you so much for your support, Solarguy! Really appreciate it. Just want to extend my support for your project. I'm glad it looks as though you will be funded. Over the last month, Dash India has been working on significantly revamping our research report, based on the feedback received by the Community. We are pleased to release it to the network today. This report contains much more material and analysis on the Indian Remittances Space and also includes a targeted survey, which we have compiled from filtered respondents over the last month. While the report pertains to India, we believe it contains information relevant to many other geographies. We hope you will find it informative and consider supporting our efforts to bring Dash Remittances to Indian Users. Based on the feedback received from the community, we have been working on updating our research report with more details and information about the Indian Remittances space. We have also conducted a fresh survey with users to better understand some of the challenges faced by Indian Remitters. The report will be published on Dash Forums and Dash Central on the 25th of October, 9 PM GMT. We understand that the community is large and spread out and it is important to publish updates on multiple channels to reach more of the network. As part of our reporting, we were in regular touch with Dashwatch. However, we will be enhancing our reporting and will be posting regular updates on Forums, Dash Central in addition to providing all details Dash Watch. Our aim will be to ensure we are able to reach out to as many MNO’s as possible and keep them updated with the latest on our work. As ever, we would like to thank the entire community for their feedback over the last month, both positive and negative. We are available on Discord (DashIndia) and Forums (Supreetraju) and Email (dash.teamindia@gmail.com) in case there is there is anything you would like to tell us or discuss. We have also discussed ways to rationalise costs further. We are confident that we will be able to achieve aims materially with the remaining months of this proposal. We hope you will consider giving us an opportunity to continue working and help Dash find meaningful grassroots level traction in India. A brief summation of our work thus far and some points discussed in the comments below. Our previous project for 94 Dash was spread over 5 months, comprised of many deliverables including but not limited to outreach, creating custom video content in two different languages, making a remittance guide and contributing to getting the Dash Movement started in India. We have strived very hard to deliver as much work as possible despite the steep depreciation in the value of Dash and have taken paycuts to ensure we are able to deliver as much as possible. The research work carried out comprised of on-ground, in person interviews with a targeted audience along with secondary research work from verified data released by institutions. This work not only contributed to our report but also helped us understand what content to put into videos. Based on the feedback received from the community, we are in the process of releasing an updated version of our research report in the coming days containing more data points and more in-depth analysis. Our endeavour with this proposal is to build a vibrant Dash Community in India through a combination of online and offline educational efforts and workshops . There is very little awareness about Dash outside of a small audience in India. We believe building confidence through education is a critical first step in mainstreaming Dash in India. We are fully dedicated to increasing the financial freedom enjoyed by the average user in India leveraging Dash. We have been in constant touch with Dashwatch throughout our entire project and given them a monthly update since April. We would also like to thank all the MNO’s who have taken out the time to privately discuss the project and its scope. We are open to critique, feedback and suggestions of all hue and nature. We are available on Discord (DashIndia) and Forums (Supreetraju) and Email (dash.teamindia@gmail.com). Please do feel free to reach us with any suggestions / inputs and we will try our best to take them on board. Our work in the field thus far has given us a strong perspective on the areas that can create maximum impact and develop strong momentum for Dash in India. We have designed a series of events and activities to help us break new ground. We hope you will consider giving us an opportunity to continue working to develop a vibrant Dash India community with enthusiasm. Hi Deep Blue, We got your email and have responded. @dash-india I will send you an email today regarding this project. This message is to confirm I am the owner of the email account for security purposes. P.S please keep my private email private. i.e. please do not post my private email here or on any other public forum. Thank you! And your pitch about "biggest remittance market" is equivalent to the often heard startup pitch of "this is $100B market, all I need is just 1%..." without a winning strategy and strong execution, how big the market is irrelevant to you! So using Dash instead of centralized currency isn't a winning strategy in your eyes? We stated the figures to show how widespread the use for remittances is in India and highlight potential. Ofcourse, remittances is a highly competitive market with multiple players. We are only proposing to work on creating an early adopter set of informed users through educational workshops and build a community in India. Anyone who has done startup can tell you -- you got a lofty goal but a clearly losing strategy by relying on Google Adwords, Facebook Ads and Youtube Ads. Do your homework, think harder and come back w/ something more creative. This proposal focuses on workshops, building educational content and media outreach. While aren’t relying on social media advertising to spread the word for this effort. While I have been following and interested in and supportive of your project so far on a hypothetical basis, I don't feel that the work you've done and content you've delivered--beyond the videos--has really been worth the amount of Dash we've paid. The information provided from your previous efforts is such that it could have easily been gleaned by a Google search without much effort. This doesn't inspire confidence for increased funding for further work. There are a number of other proposals in other areas of the world that are doing much, much more with the same or less. Personally I feel we're going to need better assurances that you'll be able to carry this work out, better documentation of the work itself, and a re-evaulation of what is a reasonable budget request for this work if you reasonably anticipate being funded this time around. We have been very appreciative of your support thus far and are disappointed to read that you feel that we haven’t been able to fully meet your expectations. Our previous project for 94 Dash was spread over many months, comprised of many deliverables including but not limited to outreach, creating custom video content in two different languages, making a remittance guide, developing a platform. We have strived very hard to deliver as much work as possible despite the steep depreciation in the value of Dash and have taken paycuts to ensure we were able to deliver as much as possible. The research work carried out comprised of on-ground, in person interviews with a targeted audience and secondary research work from verified data released by institutions. This work not only contributed to our report but also helped us understand what content to put into videos. In our desire to keep the report brief, actionable and concise, it appears that a somewhat different perception seems to have been given. We are completely open to critique and feedback. We are completely committed to our work and are in the process of releasing a longer form version of our report in the coming weeks with more information, irrespective of the outcome of this proposal. We are fully dedicated to bringing Dash to India. Our work in the field thus far has given us a perspective on the areas that can create maximum impact and develop strong momentum for Dash in India. We hope you will consider giving us an opportunity to continue working to develop a vibrant Dash community in India and win back your renewed favour. We don't have any record or indication that these efforts were carried out or completed. Statistics and claims can be fabricated or pulled from other sources. All we know is that you created two short videos, a small website, and a few pages of content, but we don't have any other information about where it came from, who made it, and who is being impacted by it and how. We need more assurances, more documentation, and more evidence that the work you're doing is impactful. At the request of MNOs, a member of Dash Watch has examined the research conducted in the previous India Remittance proposal. This writeup includes a summary of costs, an examination of the primary research, and includes the unformatted report by the India Remittance team. Thank you for your report, Dash Watch. Just to add, the on-ground, in person survey was designed under an overall local context. It served the twin purpose of helping us compile the research report as well as prioritise points for developing educational content, to ensure maximum impact. For example, Demonetization was called by the Indian government in Nov 2016 which essentially meant all currency notes of RS.500($7) & RS.1000($14) became worthless overnight and had to be returned to the banks. So the effect on a citizen varied depending on the cash on hand available. I like the idea, but have you shared your website publicly (I can't tell from the proposal)? Because the website remitdash.com is not good. Your front page uses words like "crypto" and "blockchain" -- yikes! Mom doesn't know what these mean, and she doesn't want to. It's also poorly organized and graphically ineffectual. Good luck and thank you for your interest. Our endeavour with this proposal is to build a vibrant Dash Community in India through a combination of online and offline educational efforts including workshops. There is very little awareness about Dash outside of a small audience in India. We believe addressing this information gap and building confidence through education is the critical first step in mainstreaming of Dash in India. Merchants, for instance, are more likely to come board, when there is a base level of informed users in India willing to spend Dash with them. Since remittances are widely used in India (25 Million Expatriates plus a significant population of Freelancers), we have targeted this particular use case with Remitdash to begin with and focused our efforts on it. We also aim to develop much more content on it to teach new users about Dash and proactively address user doubts. We also aim translate this content into regional languages to reach a broader audience. Our workshops are designed to teach users from scratch about using Dash and support users in making their first Dash Transactions. We would be more than glad to collaborate with other Dash Proposals and leverage their work and share our experience with them. We will be responding to the call for comments, when the draft policy for regulating virtual currencies in India does become available. We are completely open to critique and feedback. Please do feel free to reach us with any suggestions / inputs on the platform and we will try our best to take them on board. We are available on Discord (DashIndia) and Forums (Supreetraju). Unfortunately, conclusions derived from the original research survey are not valid(see HERE). Many of the questions are faulty by design, and the possible answers structurally cannot provide accurate information. Several examples and explanations follow. You have my support, good luck. Thank you so much for your support Qwizzie, we really appreciate it. Without providing a product for Indians to use for remittances you are nothing more than an Educational/Marketing proposal. You can provide all the knowledge there is to people but they can still ignore it and keep using whatever they are using right now, because it works. If you want widespread adoption for the remittance market in India you need to build a product that will be a no-brainer not to use it and will alleviate most of the users concerns. We believe it is critical to build a community in India and capture mindshare early on. The crypto movement is only beginning now in India and spreading awareness now can help us build up the moat of an early mover advantage. Sending money with Dash to India is already cheaper than other methods and remittances is a great use case to popularize the use of Dash. Building better remittance rails is a seperate but entirely complimentary effort. A product will significantly benefit from a vibrant Dash India community to launch with. If you do agree with the above, I hope you will consider supporting our work. "Sending money with Dash to India is already cheaper than other methods and remittances is a great use case to popularize the use of Dash. Building better remittance rails is a seperate but entirely complimentary effort. A product will significantly benefit from a vibrant Dash India community to launch with. " I do not agree with this. Only a small amount of people of your community will go through all the hurdles of cryptocurrency to get cheaper remittances. Not to mention that the other end will need to partake in that journey also. People want cheaper remittances. They don't really care how you can achieve it. Educating them about Dash won't accomplish much for the common population. You will probably attract technology focused people if they weren't already exposed but beyond that it's looking quite pale to me. Download a dash wallet to start sending and receiving money for a few cents! In fact sending a regular transaction costs fractions of a cent ! But as it stands I don't see, how this would benefit Dash without actually providing the remittance service as well. Thank you for your comment and viewing our work. A regular remittance to India costs close to 7%. For a $200 transaction, this amounts to nearly $14. Unlike Dash, Services promoting “send money for a few cents” have hidden charges involved. Often In the form of an opaque currency conversion fee(Paypal) or fixed fees(SWIFT). In fact Indians pay nearly $5 Billion in remittance fees every year to send $65 Billion back to India, a loss of hard earned money. Even with the current ways of converting Dash to local Fiat, sending money with Dash is cheaper and safer. As better remittance rails evolve(Dash-Local Fiat), users can gradually be upgraded to them. India is beginning to wake up to the crypto revolution. We believe it is critical to develop brand awareness, trust and name recognition and build a Dash Community in India. India can be a major market for Dash and Remittances is best use case to begin with. I hope you will re-consider your decision to support to our proposal. Happy to answer any further queries. I commented at the fact that sending dash cost less than a fraction of cent. We had factored in the fees required to send money through private and instant send, appreciation in Dash Value and/or network congestion. We mentioned a couple of cents just to be on the safe side. However, we see your point too and will factor it in. Thank you for pointing this out. Come on guys, India is a HUGE market and we can afford to slowly build-up a presence over there. The research information we have already paid may also be important for other remittance projects. Can you state how you will make you research reports available on making remittances to India to the DASH network? All our content including videos, remittance guide is research report is available freely to the Dash Community. We have been in touch with other proposal owners as well would be delighted to collaborate with them to adapt/ translate our educational content into multiple languages to reach more geographies including but not limited to Phillippines, Mexico and of course Venezuela. Remittances is an exciting use case for Dash to grow with and we hope to contribute in this area, not just for India but for all country teams. I know we are focused heavily on Venezuela but we should really be dipping our toes into other areas. This is a fair price to maintain a project/team focused on India development. Thank you so much for your support, RobbyDash01. We really hope to grow the Dash Community in India via the massive remittances market. 1. It would be very hard for us to ascertain monetary value to research. For me and our team, research is the first step for making inroads into any new market. Spending money without first gathering information cannot possibly lead to effective long term results. We value our research as a significant step to developing remitdash.com because we discovered many new things about Indian users. For example, after demonetization in November 2016, most of our interviewees openly admitted that they fear third party and regulatory confiscation while using crypto. As a result, we realised the importance of teaching users the value of private send and included this content in our videos. 2. Apologies, I didn’t realise this point remained incomplete. Our initial project was hampered by the steep fall in the value of dash. When dash depreciated, we started with taking paycuts but with further depreciation, we re-evaluated our milestones and available budget and decided to focus on creating a quality platform that can educate users for long term adoption. We first prioritised the budget for content and platform which unfortunately cut into the giveaway budget. Also, During a trial run of the giveaway, we found many dubious signups, which were hard to verify as genuine remitters and we didn’t deem it fit to blindly distribute Dash, so we prioritised awareness. Instead we ran a Facebook campaign with the remaining budget directing people to our page and videos. By promoting educational videos, we were able to bypass the ad ban as well. Our priority was and will remain genuine Indian remitters across the world and not attract untargeted users with Freebies. 3. We have relied on publically available data for secondary research. This data is available in many places and we have duly attributed our sources in . With our limited budget and team, it would be very difficult to be able to collect primary data from scratch. Happy to respond to any further queries. Hello good proposal i highly support this proposal because for me remittance is a big market and useful thing in Dash, not only in India but in Africa and Haiti my country. But i think you had a previous proposal so did you make a report about the progress and fell free to share them with me. Anyway Good luck with your proposal. Thank you for your kind comments. We can definitely see the big opportunity for remittances in your country, and globally. We completed the first leg of our journey with establishing www.remitdash.com, please do have a look at it. We have our original content there - videos, guide and more information. @dash-india previously as per your proposal included a research component. 4) most content is not original. 5) information provided barely skims the surface as one would expect. Hello, Please find our answers in reply to your other comment. Thanks. 1) details of your dash give away. And address's the funds where sent to. The platform Remitdash.Com is fully ready with all plans complete as stated in the previous proposal. The new budget request (12 Dash ) is for stage two of this platform that aims to introduce an interactive area and referral program for users. The budget request is for new features and not for anything relating to the previous proposal. This platform currently showcases two custom made animated videos, and a full fledged remittance guide to explain dash and benefits to new users. We believe public awareness is critical to bridging the information gap and explaining how dash can help new user save money. We also have been in constant communication with Dashwatch. The report is available at https://dashwatch.org/files/1532791309360.pdf . It might be also pertinent to mention that due to the severe depreciation in the value of Dash, our project was significantly underfunded. Our team has taken pay-cuts to enable us to deliver more value to Dash. We have chosen adapt our execution to ensure we are make the most of the resources available to us. We have intentionally kept the research concise and on-point so it remains readily readable. The report intends to draw out the major segments in the Remittance Market state wise and understand some of the reasons that might hold people back from utililizing crypto-currency for remittances. The report is a combination of primary and second research. In addition we have conducted several interviews with remitters including many freelancers. The overall aim of our endeavour was to create an overall plan to move forward with promoting Dash use for Remittances. The idea of a concise final report is to give people an insight into the Indian remittance market and its problems while highlight key measures for easy perusal without information overload. The data on our research report has indeed been collated from publicly available information on international remittances received by India from 16 different sources. The report is sum total of many hours of effort at the level of data collection and summation. We have provided attributions wherever possible. We would love to add more to the research report if you feel any issue or point is not sufficiently explained, as we have all information available. We have worked hard for 6 months on a small budget (94 Dash overall) and with a lot of passion for bringing Dash to users in India. We see amazing enthusiasm and potential for Dash in India. We hope we can continue building the Dash Community in India and spreading the message to new users.